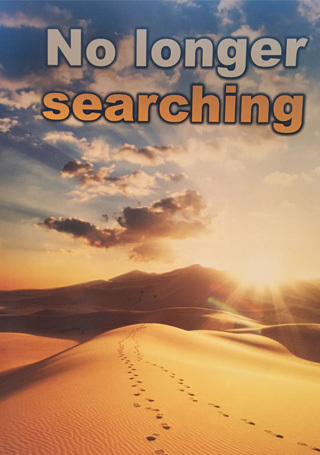 It is a wonderful experience for somebody who has been searching for many years to finally be able to say, “I am NO LONGER SEARCHING!” My own personal search for the assurance of salvation included long years of walking in spiritual darkness. My involvement in religious activities and a genuine effort to do my best never brought me the assurance I needed, the certainty that my sins had been forgiven and that I would go to Heaven when I died. I faithfully adhered to the teachings of my Church and sincerely made every effort to lead a good life. However, having done all this I still had no assurance that I, or the Church to which I belonged, had done enough to secure my salvation. The assurance for which I had been searching finally came to me as I was reading the Scriptures. I discovered that my salvation did not depend upon what I could do but upon what Jesus Christ had done for me. God said in His Word that my sins could never be forgiven as a result of my own good works or by my involvement in religious activities. I could never earn or merit salvation. But Christ earned it for me by paying in full the penalty for the guilt of all my sins. These were put to His account. The merits of Christ’s sinless life and His substitutionary death on the cross would be put to my account. My sins would be forgiven as a result of Christ’s work on my behalf. Here in God’s Word was the assurance of eternal life! My search was over.